Before we get into the heart of today’s post, I need to whet your appetite. You do not want to miss today’s recipe. It comes from my sister-in-law Cora and is amazing. Appetite whetted? Good. Way back in the day, I was an International Relations major at Boston University, with a focus on developing countries. When I met the folks at ONE about a year ago, I was super excited to get involved and help support their work, especially since one of their main focuses is world hunger. My food blogging and international relations lives were coming together in a very cool way. The folks at ONE have been amazing to work with, too. Win, win, win! As part of the big day, I am sharing a keeper of a recipe with you below. It is so so so so good. 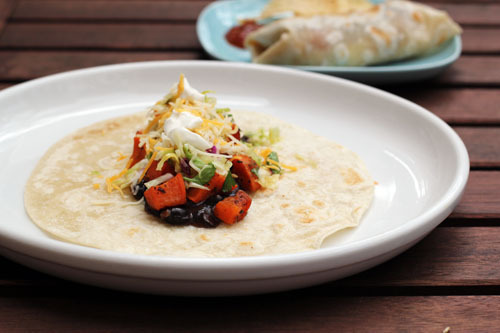 These Sweet Potato and Black Bean Burritos come from my culinarily-talented sister-in-law, Cora. The first night she made them, she called me simply to tell me how delicious her dinner was. I knew I would have to make it myself pronto! 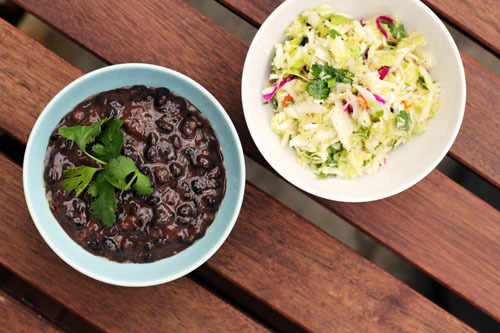 Each element of this “recipe” is great on its own: the black beans are deliciously sweet, the sweet potatoes are simple and flavorful with a hint of spice, and the slaw is fresh and has bite. When you put them all together, you get something really special. To support Sweet Potato Day, I hope that you will visit ONE’s website and see how you can get involved. There are two main issues I would love for you to check out. First, the budget. You can learn more on the budget issue and send a letter to your Congressperson on this page. Second, food. ONE has oodles of great info on food and hunger on this page, where you can also sign a petition to encourage world leaders to make hunger and food a top priority. We really can make a difference. I am blessed with abundance and want to do my part to help share the love. I hope you’ll join me! 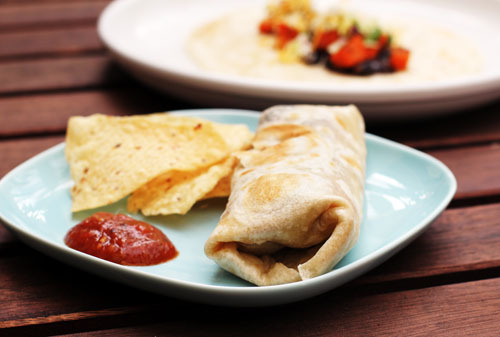 Stuff all the good food above into your flour tortillas, eat, and enjoy! Spread cubed sweet potatoes on a large baking sheet. Drizzle olive oil over sweet potatoes evenly, to coat. 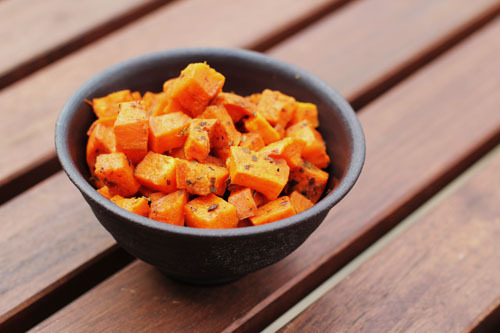 Sprinkle sweet potatoes with salt, pepper, chili powder, oregano and cumin. Mix and move sweet potatoes around on the sheet to coat with spices. Roast in a 350 degree F oven while you prepare the beans. Cook until soft then remove from oven, 10-20 minutes. Sauté onions. Combine all ingredients, including sautéed onions, in a large saucepan. Bring to a simmer over medium-high heat, then reduce heat to medium-low and simmer for about 20 minutes. 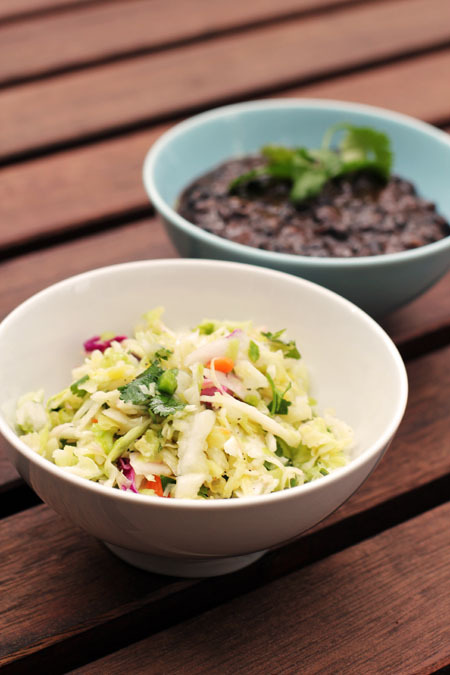 Mix all the ingredients except the coleslaw together in a large bowl. Add coleslaw and toss to coat. 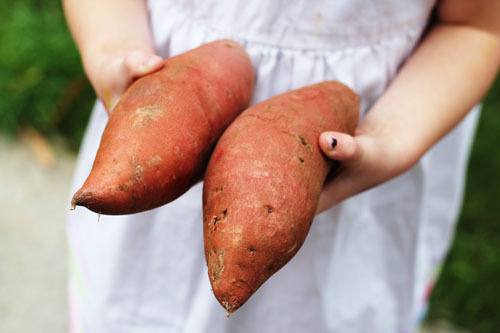 Be sure to visit the other blogs taking part in Sweet Potato Day! I have listed them all below. There is a lot of love and deliciousness in these posts. You will be well fed.